I love cable. Since there are so many channels, they are always showing re-runs of shows I never watched in the first place. Recently, I saw a sitcom called King of Queens. One of the minor characters, Spencer, is played by Patton Oswalt who I find rather amusing. In this episode, Spencer just got a TIVO and after seeing the programs it records, he becomes convinced his TIVO thinks he's gay. He tries watching a lot of sports, but the more football he watches, the more TIVO records ice skating and women's golf. My TIVO thinks I am a serial killer with a fondness for British food. It ALWAYS tapes Criminal Minds, Criminal Intent and Jamie Oliver. It should know by now that I have seen every Criminal Mind, Criminal Intent and Jamie Oliver ever recorded, but for some reason, TIVO thinks I want to see them, again. I was flipping through this week and found Jamie at Home featuring asparagus. 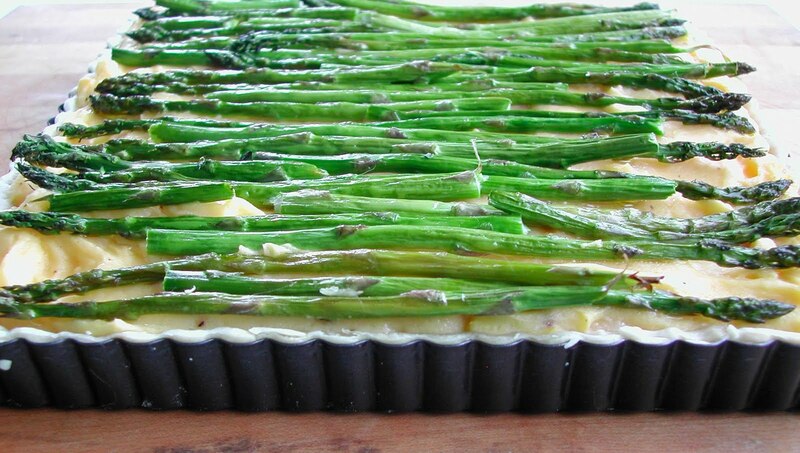 I had seen it at least 3 times but I had a big bunch of asparagus, so I watched as Jamie made his Crispy and Delicious Asparagus and Potato Tart. The recipe called for filo dough which I didn't have and Lancashire cheese which I didn't have, but I wouldn't let a little thing like missing ingredients stop me. Gotta run now, I'm making a pud and looking for the perfect place to hide a body!